In the Harvard Business Review The Neuroscience of Trust, Professor of Economic Sciences, Psychology & Management and Director at the Center for Neuroeconomics Studies Paul J. Zak states that people in high-trust companies report 74% less stress, 106% more energy at work, 50% higher productivity, 13% fewer sick days, 75% more engagement, 29% more satisfaction with their lives, and 40% less burnout. The team at Minnesota State – IT Center of Excellence is leading a movement to overcome gender diversity challenges in the Tech industry. As part of the second season of our Strength in Numbers series, we continue to ask women in technology leadership to reveal how Minnesota businesses can further enable and empower women to achieve and excel in technology careers. Merrill Corporation provides technology-enabled platforms for secure content sharing, regulated communications, and disclosure services. The company was founded in 1968 and is headquartered in Saint Paul, Minnesota. They pride themselves on being a trusted business partner to ensure their clients’ success. And….becoming a trustworthy partner is nurtured and grown from within. Inside its corporate walls, tech executives like Peg Mickelson are helping to create a culture of trust that encourages and supports women seeking careers in technology. PM: I am a Director of Engineering for DatasiteOne; the only SaaS application for due diligence designed to support rapid, secure and compliant due diligence globally. I lead several teams of software and DevOps engineers. Our work is interesting, challenging, fun and very collaborative. I also lead our Women in Tech employee resource group where we connect women and our allies at Merrill for networking and development opportunities. In any given meeting, we may have guest speakers from inside and outside of our company, watch and discuss TED talks, play board games, talk about how we overcame challenges in our lives and work together on giving back to our community via volunteer events. PM: I didn’t picture myself in technology at the start of my career. I felt like I didn’t understand technology and was a bit scared of it. Then, I took a job working 3rd shift so I could attend graduate school during the day and the job had a technical side to it that I really liked. It clicked with me and I’ve been a technologist ever since. Having a career in tech gives me opportunities to learn and grow as much as I want, which it turns out is quite a bit! PM: There are several factors that can influence how likely women are to stay in a technology job. It’s not uncommon for women to feel like “imposters” working in a technical field. Having support and awareness of this can help us hold negative messages at bay and encourage us to pursue our goals in the industry. It’s helpful to have lots of examples of women achieving and leading in technology. When we see other women succeed, we know we can do it too. Having visibility into those stories (or not) has an impact on our longevity in tech. In the corporate world, having policies and benefits that support women has an impact. Women may leave a company or an industry if policies do not take into consideration parental leave, development and mentoring programs, flexible work hours, etc. These kinds of programs benefit everyone, and women are often leading the charge to ask for and get these types of benefits in place. PM: Founding the Women in Tech (WIT) group was a concrete way to support and make the great work of women at my company visible. 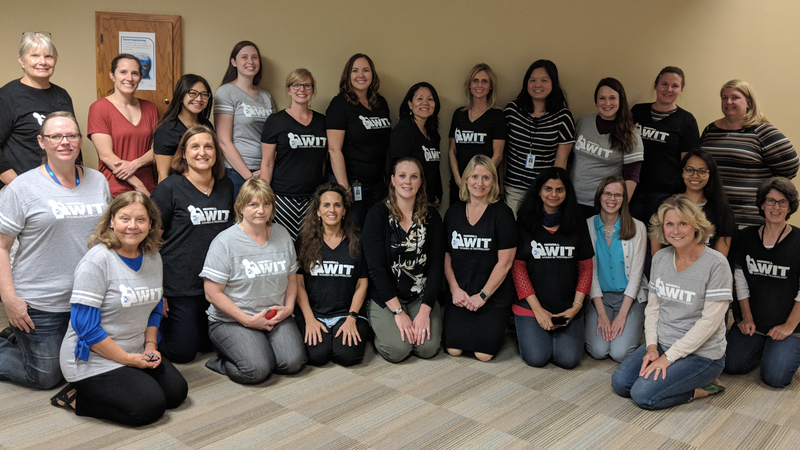 Since our first meeting, the WIT group has proven to be a space for us to have community, empowerment, and to remind us in a very real way that our contributions are amazing and important. MNAiC: What do you think are three things MN businesses can do to help remove these barriers in order to promote and retain more women leaders in technology? PM: Two things that are closely linked are sponsors and mentors. Sponsor women in your organization as well as mentor them. Sponsoring is “talking ABOUT someone”, i.e., bringing up women’s names in a leadership setting to highlight something great they did and/or to put their names in when opportunities arise. Mentoring is “talking WITH someone”, i.e., spending time with woman to listen to them talk about their successes and challenges, provide feedback, support and information. Understand the data on what percentage of employees are female in your organization and set recruitment and retainment goals in terms of gender diversity. Include leadership positions in your goals. Consider what makes a high-trust workplace and set your organization on a course to become or maintain a high-trust workplace. Let women lead in as many ways as possible – formally, informally, big teams, small teams, in meetings, and in the boardroom. Hannah Carlson (l) and Andrea Neumann (r) pose with a Minnesota Aspirations in Computing (MAiC) job shadow match, Ava Masse from Eden Prairie High School. Merrill Corporation is an Aspirations in Computing sponsor company. PM: Creating an effective pipeline for women in tech and women in technology leadership roles can be very challenging for a variety of reasons. Technology companies move very quickly and there may be a perception that positions have to be filled as soon as possible from the most readily available candidate pool which can leave out female candidates because recruiting them may take more time. Retaining female candidates can be challenging for an organization. We don’t necessarily like being the first or the only female on a team. As leaders, be thoughtful and intentional about helping to build community and support for women in your organization. PM: Develop a team of allies and mentors. If that seems daunting at first, start by seeking out thought leaders who are committed to breaking barriers for women in tech. Some local organizations as a start are: Hack the Gap, Women Who Code Twin Cities, DevOps MSP. Follow groups and individuals on Twitter, attend meetups, find and share groups that back women in your community. PM: Everyone has amazing, endless potential. Backing any under-represented group increases the chances of great technologists and great leaders rising up. Women are natural leaders, problem solvers, negotiators, and collaborators. Women bring viewpoints and talents that may be overlooked or de-valued but once made visible and valued have a major positive impact for an entire organization. PM: You can do it. Squash those voices that say anything less than that. Find resources that back you on your quests. Share your challenges and successes with others. Listen to others’ challenges and successes. Remind each other that there’s nothing you can’t do. Create a personal team of “backers” to think with and about you on your career aspirations. Be bold in asking for support and in forming your aspirations. You can go far, and it may even happen very quickly. You will go from wanting to do something big to doing something big, almost without even realizing it along the way. Surprise yourself and others! The Minnesota-based, global company provides secure, innovative solutions to complex content and communications requirements. With their deep domain expertise, exceptional service and innovative technology, they are a trusted partner in ensuring their clients’ success at every stage in the life cycle of regulated business communications. Learn more about Merrill. MNAiC collaborates with businesses, organizations and schools to inspire, support, and empower young women in high school to become our next, best Minnesota technology talent. Want to get engaged with the Minnesota Aspirations in Computing program? To learn how your organization can support the computing interests of young women in Minnesota and lead the movement to disrupt gender equality in tech, contact Russell Fraenkel, Director of IT Career Pathways and Partnerships, Minnesota State – IT Center of Excellence, at russell.fraenkel@metrostate.edu, call (612) 659-7224.